with peace of mind for persons with mobility issues to reduce slips, trips and falls. Redilight’s DaySafe is the National Disability Insurance Scheme/NDIS approved lighting solution that combines modern design with peace of mind for persons with mobility issues. The DaySafe is designed to provide quality and consistent lighting to dark spaces within the home to reduce the risk of slips, trips and falls. By ensuring a well-lit living environment, the DaySafe enables persons with reduced mobility and impaired vision to remain in their own homes longer – combining psychological comfort with physical safety. It really is the ideal and cost-effective lighting solution for the elderly or infirm. Redilight’s Daysafe is an approved Assistive Technology product within the federal government’s NDIS program that provides support for persons with disability, their families and carers in Australia. Upon approval by a registered NDIS Assistive Technology Assessor, the DaySafe system can be installed with significant or full subsidy through the NDIS. Learn more about NDIS Assistive Technology via the National Disability Insurance Scheme website. Redilight’s solar panel LED lighting system captures free energy from the sun to efficiently power LED light fittings throughout the home or office. This clever skylight alternative is more adaptable and less obtrusive than old-fashioned tubular and shafted skylights. One solar panel can be linked to multiple light fittings ensuring that the challenges of multi-level dwellings, complex roof lines and shadows are easily resolved. And don’t worry about the water proofing, insulation and security concerns that affect traditional skylights – they are simply not an issue for the compact Redilight solar powered lighting system. Manufactured using only the highest quality components, the entire Redilight range is backed by our industry-leading warranties that guarantee their performance for years to come. Ready to learn more? Discover the full range of Redilight products now. Redilight’s energy efficient light fittings come in a variety of finishes, shapes, sizes and hues to enhance the design and décor of any room. From the larger, open-plan areas of the modern home and office to smaller confined spaces like hallways and bathrooms – Redilight has the LED light fitting to meet your needs. Ready to learn more? Discover the advantages of Redilight’s energy efficient lighting fittings now. Unlike traditional skylights, Redilight’s skylight alternative delivers even when the sun is down with our unrivaled NDIS approved lighting options. 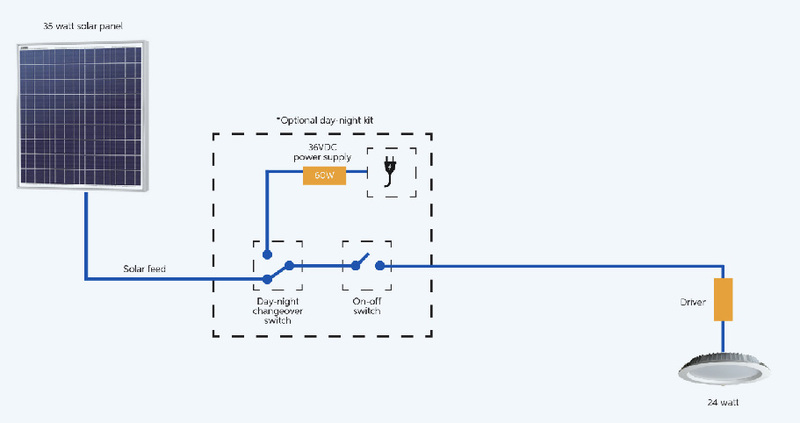 Our Day-Night Kit and exciting new Sunline System enable you to simply and seamlessly alternate between power from the solar panel and the grid – either automatically or on demand. It really is the smart solar powered lighting system that complements the modern Australian lifestyle. Ready to learn more? Discover the advantages of Redilight’s smart LED lighting system options now. Our friendly sales and technical teams are always eager to help you find the right Redilight skylight alternative to solve your lighting problems. Ready to get in touch? Discover our contact options now. Can be switched off during the day.